Gaming peripherals manufacturer Razer launched its ‘Paid to Play’ rewards initiative in March last year. Under the initiative, players could earn zSilver points from the company’s digital currency platform which could be exchanged for Razer peripherals. In order to earn the digital currency, gamers were required to launch games using the Razer Cortex suite and for every three minutes played they could earn one zSilver. According to a recent post on the Razer Insider community forums, the company is temporarily suspending the initiative due to negative feedback. The post reveals that since the initiative’s launch, over 1B zSilver has been exchanged by gamers and over 35,000 rewards have been redeemed using the zSilver. However, it highlights that the company received “an increasing amount of negative feedback on the Paid to Play program” which is why it’s being temporarily suspended. The company plans to take “a hard look into the overall program and mechanics” to do right by the gamers who participated. 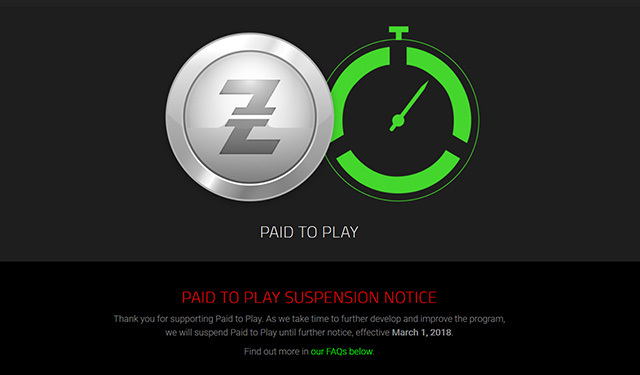 The Paid to Play program will remain active until March 1, 2018, but gamers will be allowed to exchange their existing zSilver for rewards even after the program is suspended. The company also claimed that if it’s unable to find a permanent solution to all the negative feedback, the program will be suspended indefinitely. While the Paid to Play initiative is being suspended, Razer is keeping the digital currency active. Gamers will still be able to earn zSilver by purchasing Razer gear using zGold (another virtual currency), actively contributing on Razer Insider, logging in daily on Razer Cortex, syncing their stream with Cortex: Deals, and subscribing to the deals newsletter. While the company didn’t provide any details about the negative feedback it received for the program, a forum member suggested that people were re-selling their rewards on eBay which might have been a contributing factor.